After a 24 hour sail we arrived in the port of Piraeus in the late afternoon of April 17 for another 24 hour stay. We had made ambitious plans for this port, intending to take the subway to the New Acropolis Museum that evening & see some things near there, then take the subway to the Acropolis early in the morning to beat the crowds & visit the other ruins in the neighborhood before returning for a 3:30 all-aboard deadline. But Mary had gotten a nasty cold so we decided to spend the evening in Piraeus & signed on for a Holland America Acropolis tour for April 18 (which has the benefit that the ship won’t leave before you return, thus reducing the anxiety level when there is an early departure & you are not going to be near the port). This all turned out OK, since we got to see what we most wanted & didn’t miss the ship. In 1867 Mark Twain’s plans for Athens were thwarted as well when the ship was quarantined by Greek officials (this seemed to happen to them a lot). Twain & some friends sneaked ashore at night, however, & walked to the Acropolis & back before sunrise, raiding vineyards on the way (Athens was only a small town then, however, so the police presence wasn’t as threatening as it would be today). The weather, which had been so nasty in Istanbul, was beautiful as we sailed into Piraeus. Piraeus is a city itself, but it is only about four miles from the Acropolis & has been the port for the city of Athens since ancient times (although the modern cruise port, one of the busiest in Europe, is much bigger than the ancient port and in a different location). When they were about to start the Peloponnesian war with Sparta, Athens built walls around the entire route from Athens to Piraeus to ensure access to their navy, which was their main source of military power (it didn’t work; the Spartans won the war & Athens was never the same again). So in the few hours we had on the 17th we decided to walk around Piraeus. It has a very good antiquities museum, so we headed for that. It turned out to be difficult to find, partly because the Greeks street signs were difficult to decipher & partly because the map given us by Holland America wasn’t accurate. But finally, after walking through several local neighborhoods, we came to the museum of antiquities. And the sign on the door said it had closed an hour before we docked! This was news to our travel guide, who told us she thought it would be open until about 8. Anyway, we snapped a few pictures through the fence & headed back. At the port we saw a very attractive Greek Orthodox church but not much else (we never did find the shopping district we had been told was there) so we headed back to the ship. On the ship that night was a show by a Greek folk dancing group. They were pretty good & it was enjoyable. The next morning we got up early to board the tour bus. After a (too) leisurely drive through Piraeus we went to the Acropolis, where we stood at the bottom of the hill, watching other groups go by, while our guide talked about olive trees and other interesting things that had nothing to do with the Acropolis, which is what we were anxiously waiting to see. She talked very slowly & repeated everything several times, repeatedly asking for more questions, as time passed and other groups went ahead of us. As you can tell by now, I found this very irritating, particularly since we were there at a time (10:00) when I had read that the crowds would start growing. I am as interested as the next person in the history of olive trees, but why couldn’t she give us that exposition while we were on the bus instead of at the foot of the Acropolis? Finally we climbed up to the Acropolis (its quite a climb from the ground, by the way). The Greek word acropolis means “high city,” and many ancient Greek cities have a citadel in the center with this name. The early Athenians built temples & the king’s palace on this high hill, where you could see an approaching army from a long way off. But the Persians sacked Athens in 480 BC & burned the Acropolis. Yet the Greeks won the war with the Persians thanks to the victory of the Athenian navy in the battle of Salamis & by mid-century Athens was the dominant power in the region, with great wealth from yearly tribute (oops, I mean dues) paid by its subject states (I mean, of course, its “allies” in the Athenian League). So the Athenian leader Pericles began a huge public building project to turn the still empty Acropolis into the most glorious citadel in Greece. As a result, the Acropolis we know today was entirely built within about 40 years as a coherent project, rather than an accumulation of separate buildings over time as you find in most ancient sites. Interestingly, the first stage of this project was to clear all the rubble on the Acropolis from the earlier destroyed buildings, which they buried in a big pit, which protected it (including statuary) from the ravages of the environment over the centuries until it was rediscovered and placed in the New Acropolis Museum, where we observed this early statuary later in the day. The entrance to the Acropolis is a grand building called the Propylaea. There was a grand marble staircase leading up the last part of the hill to an impressive building at the top, all marble & columns. The ruins of this building are still there today, and they are still impressive above as you walk up (although the grand staircase is gone and you now walk up a winding path). On the right as you walk up is the Temple of Athena Nike. Nike means victory (which is why the sports shoes have this name) & this temple contained a statue of Athena handing victory to the Athenians in the Persian war. The statue originally had wings (a winged victory), but the Athenians broke off the wings during the Peloponnesian War to ensure that Athena would stay and protect their city (as already noted, she didn’t . . . would you protect people who broke off your wings? go figure). This building was recently rebuilt after having been dismantled for cleaning and restoration of all its parts. Notice the parts that are a bright white, contrasting with the beige tint of the remainder of the building. The Greeks are restoring the buildings on the Acropolis to something like their original appearance using marble from the same quarry that the ancient Athenians used to fill in the gaps where the original stones are gone. This is very useful for the visitor since, as at Masada, it enables you to see clearly what is new and what is original. Unfortunately, we were told that it will not take very many years before the new marble develops the same beige sheen as the original marble, and then it will take a diagram to tell the new from the old. On the left as you walk up are the Pinacoteca (“painting gallery”), which contained art works and the Monument of Agrippa. Today the monument is just an empty 25 foot high pedestal but it has held several bronze statues over the centuries: originally of a 4 horse chariot of the Olympic winner in 178 BC, then later one of Marc Antony & Cleopatra, then of Augustus Caesar’s son-in-law the Roman General Agrippa. Imagine what all this must have looked like to an ancient visitor to Athens walking up this steep stairway to this monumental edifice. But it was very different from what you see today, even apart from the fact that the buildings are now ruins. We are used to seeing Greek temples as gleaming white marble edifices, a look we think of as “classical.” But the ancient Greeks weren’t interested in that, and they painted their beautiful buildings, friezes and statues in bright . . . one might say lurid . . . colors. The Acropolis was painted mostly in bright blue & red. Later in the day in the New Acropolis Museum we saw some of the ancient statues that still had some of their paint, along with replicas showing how the painted statue would have looked when new. And believe me, if you saw something like that in someone’s house today you would think it was in exceedingly poor taste. Yet, with the paint gone it looks like a beautifully sculpted marble classic. Anyway, I still need to show you the buildings to the left of the Propylaea. Having reached the top we walked through the Propylaea and on toward the Parthenon. On our left was the Erechtheion and in front of it the three carved flat stones that mark the spot where a 30 foot tall bronze statue of Athena, dressed in military garb, once stood. It is said that the tip of Athena’s spear could be seen 30 miles away. The Parthenon is huge & of course it is the #1 attraction of all ancient Greek ruins. It is 228 feet long and 101 feet wide, with 8 gigantic columns (34 feet tall and 6 feet in diameter) on each end, 17 on each side and 19 smaller ones on the inside. And it contains virtually no straight lines or right angles: the floor bulges slightly in the center, the pillars bulge and lean slightly toward the center. All of this was to make it look perfectly straight and square, because the Greeks knew that an optical illusion makes straight lines in buildings appear to sag and straight pillars appear concave. It is a pretty amazing piece of engineering and the optical illusion certainly works. The stones in the Parthenon are precisely cut and fit together to a tolerance of only 1/1,000 of an inch. Inside was a 40 foot statue of Athena covered in ivory and a ton of pure gold half an inch thick; it was carried off to Constantinople in the 5th Century and then vanished. In addition to its religious significance, the Parthenon contained the treasury of the Athenian League. In the 5th Century the Parthenon was converted into a Christian church (pagan images were removed or renamed, Christian frescoes added and an apse built on one end). About 1000 years later the Turks converted it into a mosque (a minaret was added). The Turks also used it to store explosives & during a war with Venice in 1687 the Venetians got lucky & hit it with a mortar shell, exploding the center of the building.. In the 19th Century the Greeks, after securing their independence, removed the minaret & converted the Acropolis into the archeological zone it is today. Across from the Parthenon is the Erechthion (or Erechtheum). It had two interior spaces, one devoted to Athena & one to Poseidon, who supposedly had competed on that spot for naming rights to the city (Athena won by giving Athens the olive tree, still a mainstay of the Greek economy with more than 100 million of them in the country). The porch of the Caryatids, with its columns sculpted into women, is the most famous part of this building. The Caryatids on this porch today are replicas (really good ones); we saw 4 of the originals in the Acropolis Museum later in the day, one was sold to the British Museum by the infamous Lord Elgin & one is in France. It is smaller than the Parthenon but is quite beautiful & was at least as prestigious in its day. The view from the Acropolis is spectacular, to say the least, & there are a lot of well known landmarks you can easily pick out. Here are Lykavittos Hill, the tallest spot in Athens, with the Chapel of St. George at the top. The marble quarries used by both ancient and modern Greeks are in the mountains behind it. Here also is Mars Hill (“Areopagus” or hill of Ares, the Greek name for the god the Romans called Mars), where Paul preached to the Athenians (with little success). Paul really got around. Here is the Pnyx, a hill not far from the Acropolis that was the site where the citizens of Athens gathered to debate and vote in the first democracy. And the well preserved Temple of Hephaistos that sits next to the Agora, the primary marketplace of ancient Athens. Here is the remarkably well preserved 1st Century BC Tower of the Winds, on the edge of the Roman Forum, an octagonal marble tower with reliefs on each side of what are believed to be the Greek symbols for the winds. It served as a weather vane, sundial and water clock, all in one. 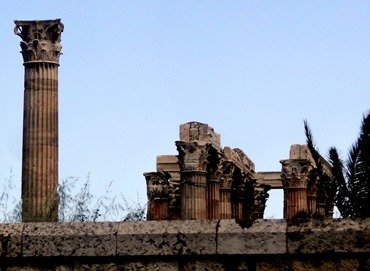 And on the right are four pillars, which may be what is left of the 2d Century AD Library of Hadrian, really a cultural center that included a library. I’m pretty sure the roof air conditioner in front of the pillars is of more recent vintage. On the other side of the Acropolis one can see Hadrian’s Arch & the Temple of Olympian Zeus. Hadrian’s Arch was built as the dividing line between old Athens & a new housing project sponsored by the Emperor called Hadrianopolis. On the side of the arch facing the Acropolis is inscribed “This is Athens, ancient city of Theseus.” On the other side is inscribed “This is the city of Hadrian, and not of Theseus.” The Temple of Olympian Zeus beyond the arch was the largest temple in Ancient Greece, 360 feet by 145 feet with 104 columns 56 feet tall (15 are still standing). It was begun in the 6th Century BC, but lay uncompleted until Hadrian had it completed in 132 AD. It had a colossal statue of Zeus inside . . . and an equally large one of Hadrian. That Hadrian really got around (he’s also the guy who built Hadrian’s Wall between England & Scotland). We got a somewhat closer look at these from street level after lunch, so I will include those views here. Before we leave the Acropolis, here are a few random pictures. There is a large & storied Greek flag at the end opposite the Propylaea on a platform; the day we were there it was extremely windy in that area, to the extent that I had to take off my hat to avoid having it blown away. And there is a remarkable amount of rubble (ie. apparently unidentified pieces of marble and of old columns) all over the place; many of these have been cleaned & identified and are waiting to be used in the renovation of the Acropolis. So then we left the Acropolis, after much too short a stay, descending through the Propylaea and down the steep stairway. Mary was a little irritated because we were just about the last ones at the meeting place & I wouldn’t stop taking pictures. Next we went to the New Acropolis Museum at the foot of the Acropolis. It is a marvelous glass dominated three level structure which houses most of the artifacts that have been removed from the Acropolis for protection from the elements. The Acropolis has often been looted for marble to use in other buildings (the Beule gate in front of the Propylaea, for example, was built with marble scavanged from the top of the hill), but the most famous looting was by the English Lord Elgin, who took most of the marble friezes from the Parthenon & one of the Caryatids from the Erechtheum, among other things, and sold them to the British Museum where they reside today, known as the Elgin Marbles. The British had long justified refusing to return this stuff on the grounds that they were better preserved in Britain because the pollution in Athens was deteriorating everything on the Acropolis. This justification was, in fact, true enough; we were told that most of the deterioration of the artifacts on the Acropolis has occurred over the last 50 years from pollution, and that before that it had looked well preserved. The Greeks hoped that the new museum, with its state-of-the-art environmental protections would convince the British Museum to return these artifacts, but now the English say that returning these artifacts would set a precedent that would empty all the museums in Europe (even if true, the response ought to be: so what, other things that have been stolen should be returned too). When digging the foundation for the Museum they came across the remains of an Athenian neighborhood occupied from about 200 BC to 600 AD. That is now an active archeological site which can be viewed through the glass sidewalk over which visitors enter the building. Actually, most of the interior of the museum has glass floors as well. Unfortunately, photography is not permitted on the first two floors of the museum, so I can’t show you all the ancient statues and other artifacts we saw from before the Parthenon period right through to Hellenic & Roman times. It is a fascinating journey through time, including history and the development of art. Even the four original Caryatids in the museum cannot be photographed. However, one of the people in our group noticed that you could see some of the Caryatids through the glass floor of the top floor, where photography is allowed. Best of all, several of the Caryatids are temporarily cut off from view while they are being cleaned using lasers, and the cleaning process could also be seen through the glass floor. So Mary stood over this spot in the floor to cast a shadow which enabled me to take some surprisingly good pictures. Since the museum closed all this off from public view, I am not sure they are aware it can be seen (& photographed) through the floor from above; it was certainly a surprise to our guide. The top floor is devoted to the Parthenon. On one side is a massive window with a great panoramic view of the Parthenon and the Acropolis. Inside the third floor, which is precisely aligned with the layout of the Parthenon, is a lifesize mockup with the entire frieze from the Parthenon mounted on it. The frieze was 525 feet long, went all the way around the wall inside the columns & depicted the annual Panathainic procession up to the Acropolis to pay homage to Athena for the birth of the city. Actually, its not the entire frieze, since Lord Elgin took all the best parts to England & there are a few items in other parts of Europe, but it contains all the original stones available from the Parthenon along with plaster casts of the parts in the British Museum & others. There is blank plaster where parts have completely disappeared. You can clearly distinguish the casts, which are pure white, with the original stones, which have a tan cast to them. It is hoped that one day the original stones will be obtained to replace the casts and the frieze will be completed as much as possible. Here are some photos, mostly of original pieces. As you look, remember that these were all painted in vivid. more than life-like colors. The Parthenon also had rather famous deep reliefs in the triangular pediments on each of the shorter sides of the building. The museum has a plaster model of the original appearance of these pediments. It also has the remaining original pieces of them (not in very good condition) integrated with casts of the parts carried away by Lord Elgin (which are in much better condition). Then one last look at the Parthenon before leaving the museum. After leaving the museum we walked to a restaurant near the Acropolis for lunch. It was a nice walk on a pretty day & the restaurant was quite colorful, full of murals, and served delicious Greeks food (the Greek yoghurt for dessert in particular). Then we walked down the hill & through a neighborhood to meet the bus. Near the meeting place, at the foot of the Acropolis & near Hadrian’s Arch is a marble bust of Melina Mercouri. You might wonder why a marble bust to a film actress known for playing racy women (Topkapi, Never On Sunday), but after her film career Melina Mercouri was a leader in the movement to oust the military dictatorship & she served for many years as Minister of Culture in the resulting democratic Greek government, so she is something of a political hero in Greece. The bus took us to the Olympic Stadium, the only all marble stadium in the world (we were told), originally built by the ancient Athenians for their games and renovated in 1896 for the first modern Olympics. Back in the bus, we drove past an archeological site dug from a public street (I think this might be the one where a new subway stop disclosed some ancient ruins), then we drove to the Parliament building, where we got out of the bus to see the changing of the guards in front of the tomb of the unknown soldier. There was already a crowd there & we weren’t given much time (I think the bus was parked illegally), but here are a few pictures. I have read that those pom-poms on their shoes date back to the ancient Athenians, & their skirts have 400 pleats, one for every year of Ottoman rule (these uniforms originated in the Greek war for Independence in the 1820’s). Back in the bus we drove past, among other things, the house of Heinrich Schliemann, who discovered Troy & lived here afterward with a Greek wife he met through a contest to find a woman as interested in archeology as he was. We also saw the National Library (yay!) & Athens University, which our guide said is the best example of neoclassical architecture in Athens. Finally, after a very full partial day indeed, we headed back to the ship for a 3:30 All Aboard deadline, and at 4:00 we sailed away under sunny skies in a deep blue sea, toward Dubrovnik.